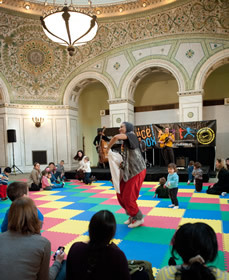 Chicago Cultural Center Free events for kids. When: First and third Friday, 11-11:45 am. Check schedule or call before heading out. Subject to change. Get your kid’s creative “juices” flowing the first and third Friday of the month. Juicebox offers Chicago’s best music, dance and theater in a kid-friendly setting. A free series of cutting-edge performances, Juicebox is geared to toddlers but is engaging for the whole family. Engaging music and dance in a kid-friendly setting, the FREE admission Juicebox programs are geared toward the stroller set and enjoyable for the whole family. Children will experience a diverse range of artistic and educational presentations, with hosts regularly inviting youngsters to move, dance and interact with performers. Presented by the Chicago Department of Cultural Affairs and Special Events and Lifeway Foods. The Juicebox series runs on alternating Fridays at the Chicago Cultural Center and Saturdays at the Garfield Park Conservatory, with occasional special events at other venues. Except where noted, performances are 11-11:45am.